One of the advantages of a raised-bed garden is that the above-ground soil has an opportunity to heat up during the day. The warmer soil allows vegetables to be planted earlier than would be possible otherwise. We sprouted beans in March and planted them on April 8th. They have been in the ground a few weeks now, have clearly established themselves, and have begun sending out climbers. This encouraged us to think about getting some tomatoes and other plants into the GrowBed. April 13th was another above-65º day. We didn’t have much on our schedule and thought it would be a good time to make a Home Depot run. Fortunately for us, it was also the day of their first delivery of vegetable plants from their supplier. We had “first pick” of plants as they were being unloaded from the truck onto the shelf. Home Depot’s supplier is Bonnie Plants of Union Springs Al. All of the seedlings looked vigorous and were shipped in biodegradable pots. We purchased two indeterminate and one determinatevariety of tomatoes. We used zinc garden markers to label everything once we got them planted. The metal markers are helpful because we mark the date of planting as well as the type of plant. 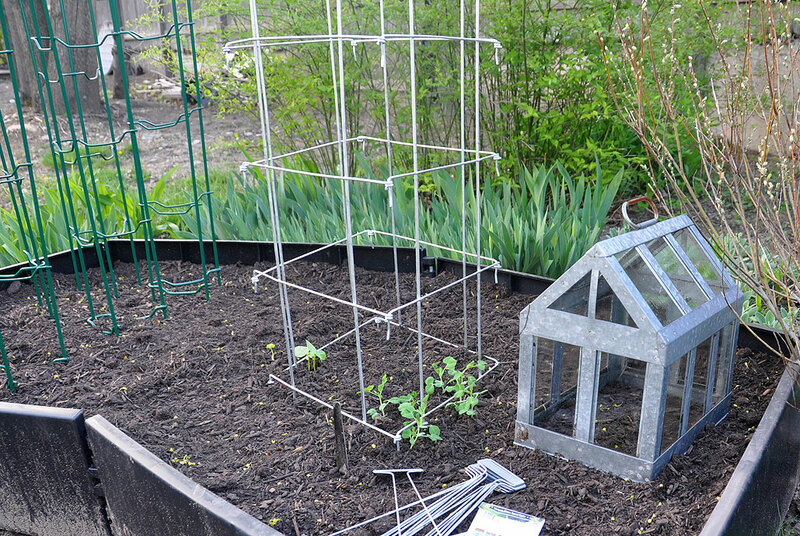 Unlike the short plastic labels, the metal markers have long stems so they stay put in the garden. The nice thing about biodegradable pots is that they are better for the environment and the plant. Being able to plant the tomatoes without having to take them out of the pots meant no “root shock” or accidental damage to the main stem. All that was needed was to give the pots a good soaking, dig a hole, and put in the plant. The two indeterminate ones (Husky Cherry Red, Beefmaster) will get the taller cages and the determinate (Celebrity) one will be planted in front and supported by the short cage. All the photos above were from at least a week ago. The photos below were taken on April 22nd. The irises in the back of the GrowBed have started to bloom. The average daytime temperature last week was around 65º, but some nights still went below 50º. The rule of thumb for planting tomatoes is to do it when the ground stays above 50º. We were able to “violate” this rule because the GrowBed’s soil temperature is warmed by the sun during the day and dissipates slowly at night. This has enabled our tomato plants to get almost a three-week head start compared to last year. 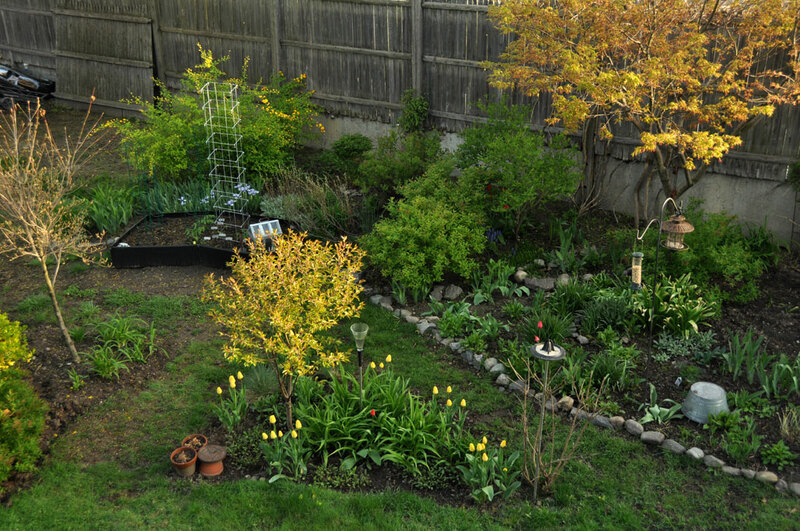 The rest of the RainyDayGarden has also started to fill in nicely. The tulips have been popping up for weeks and many of the early bloomers have already dropped their petals. The hostas, alliums, and daylilies are all coming along well. They should be starting to bud in another couple of weeks. We have been slowly spreading the violets and japonicas around the garden. This year was the first year where we really notice a nice healthy growth of both in several spots around the grounds. The japonicas have these wonderful yellow flowers which bloom the length of the branch. They are easy to get established, are very hardy, and make a great separator between properties. They are an especially good plant to use if your neighbor’s property is not all that well kept, as they enhance the view very nicely. While many of the early bloomers have started to fade, the next in the sequence are beginning to unfurl. The best part of planting a perennial garden is seeing the plants come and go each year. They are much like friends who come to visit year after year. They bring a smile, help us mark the seasons, but never overstay their welcome.